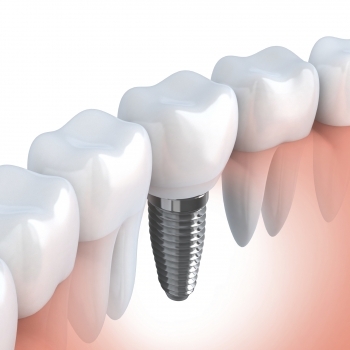 A dental implant is an artificial tooth root that is placed in your jaw to hold a replacement tooth or bridge. Dental implants are a wonderful option for people in good general oral health who have lost a tooth or teeth due to periodontal disease or an injury. Dental implants save the tooth a bit better than traditional bridgework because implants do not rely on neighboring teeth for support. Dental implants are natural-looking and feeling and can give you confidence about the look of your smile. You will no longer have to hide your smile because of spaces from missing teeth. If you have difficulty chewing, talking and would like to smile again with comfort and confidence, then dental implants may be the perfect solution for you. Under proper conditions (perfect placement by your implant dentist and diligent maintenance by you), your dental implants can last a lifetime, and studies are showing improving success rates for dental implants. Endosteal (in the bone). This is the most common type of implant used, and each implant holds one or more prosthetic teeth. This type of implant is often used as an alternative for patients with bridges or removable dentures. Subperiosteal (on the bone). These implants are placed on top of the jaw with the metal framework’s posts protruding through the gum to hold the prosthesis. These implants are used for patients who are unable to wear conventional dentures and who have minimal bone height. Tooth-saving. Dental implants do not sacrifice the quality of adjacent teeth like a bridge does because neighboring teeth are not needed to support the implant. More of your own teeth are left untouched, which is a significant benefit to your overall oral health. Aesthetic. Dental implants feel and look like your very own teeth. They also prevent bone loss and gum recession, which often accompany bridgework and dentures. No one will ever know that you have dental implants unless you tell them. Reliable. Success rates for dental implants are very high and are considered an excellent option for tooth replacement. To replace a single tooth. One implant and one crown can replace a single missing tooth. The implant replaces both the tooth and its root. To replace several missing teeth. Implants will replace both your lost natural teeth and some of the roots. To replace all of your teeth. An implant-supported full bridge or full denture can replace your teeth. Dental implants will replace both your lost natural teeth and some of the roots. Sinus augmentation. A key to implant success is the quality and quantity of the bone where the implant is going to be placed. The upper back jaw has been one of the most difficult areas to successfully place dental implants due to insufficient bone quality and the close proximity to the sinuses. Sinus augmentation can help correct this problem by raising the sinus floor and developing bone for the placement of dental implants. Ridge modification. To correct deformities in the upper and lower jaw that can leave you with inadequate bone in which to place dental implants, the gum is lifted away from the ridge to expose the bony defect. The defect is then filled with bone or bone substitute to build up the ridge. Ridge modification can increase your chances for successful implants. As with any dental procedure, at-home oral care and regular visits to your dentists are necessary to keep your implant in place for many years. After dental implant treatment, your implant dentist will develop a care plan just for you to ensure your implant, teeth and gums remain healthy. If you would like to learn more about how dental implants replace a missing tooth or teeth, please call or email Dental Touch Associates today to schedule an appointment.